Camping is always a fun and energetic activity to be involved in. It doesn’t need any sweeteners to improve the experience beyond what you do, and don’t, expect. But one of the main reasons people avoid the great outdoors is the comfort factor. If the experience isn’t as comfortable as possible, then you just can’t enjoy it as much as you’d like to. That’s where camping gadgets come into the equation, bridging the gap between the great outdoors and home delights. Previously, camping was all about getting as far away from day-to-day life as possible and “roughing it” for a week. Now, it has evolved into many different forms to accommodate the tastes of even the snootiest of campers. With the growing demographic in mind, manufacturers have set out to create some extremely useful and cool camping gadgets. And, if you know where to look, you can find them at reasonable prices. But what exactly are these amazing gadgets taking the camping world by storm? Let’s take a look at some amazing camping gadgets you never knew existed. Just because you’re staying in the bush and sleeping on the dirt, doesn’t mean you have to live like a gross creature. There are loads of camping gadgets that preserve your hygiene, sanitation, and your dignity too. A pressure shower is a practical option for campers who feel that baby wipes provide insufficient protection against bacteria during the trip. 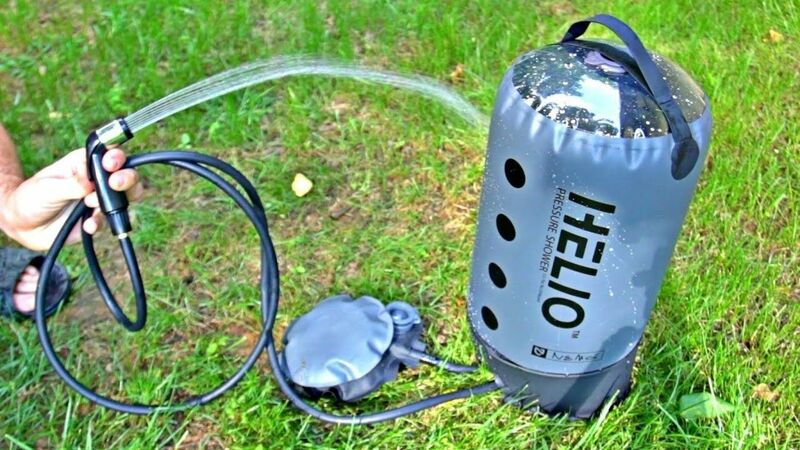 These camping gadgets provide a steady stream of pressurised water that you power with a foot pump and control using an attached hose. Once you fill the container with water, pump it to pressurise it, then direct the stream of water using the handheld hose pipe. There are some larger camping showers that include a plastic container that will allow more water for the user. However, they are significantly less portable. This compactible camping gadget has been designed to make it ultra-convenient for campers on the move. Have you ever thought that it would be good to not have to lug around a tent, sleeping bag and your waterproofs? What if all three were thrown into one neat little package? 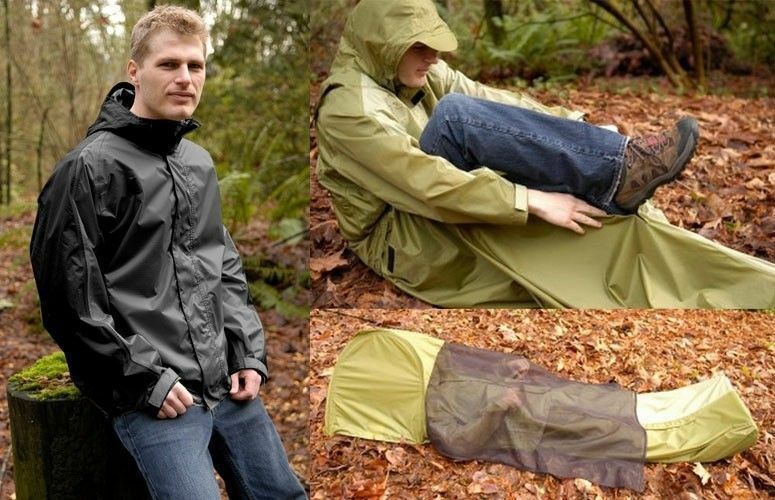 Introducing the JakPak Waterproof Jacket, Sleeping Bag & Tent combo. This amazing multipurpose delight is a intelligent product for everyone from keen adventurers to casual campers. This camping gadget takes many potential situations and marries it with the important features of all three combinations to produce one of the smartest cool camping gadgets invented. Incorporating a single berth tent, waterproof sleeping and a waterproof, breathable jacket is clever. What takes this camping gadget to another level are the technical elements of the respective forms. The JakPak accounts for three seasons (spring, summer and autumn). It’s flame retardant for safe use by the campfire and includes pockets, flaps, zips and cords to making it a very secure camping gadget. This is one of our favourite camping gadgets. It’s not the most important but it can come in handy if you really fancy a brew whilst on the campsite. 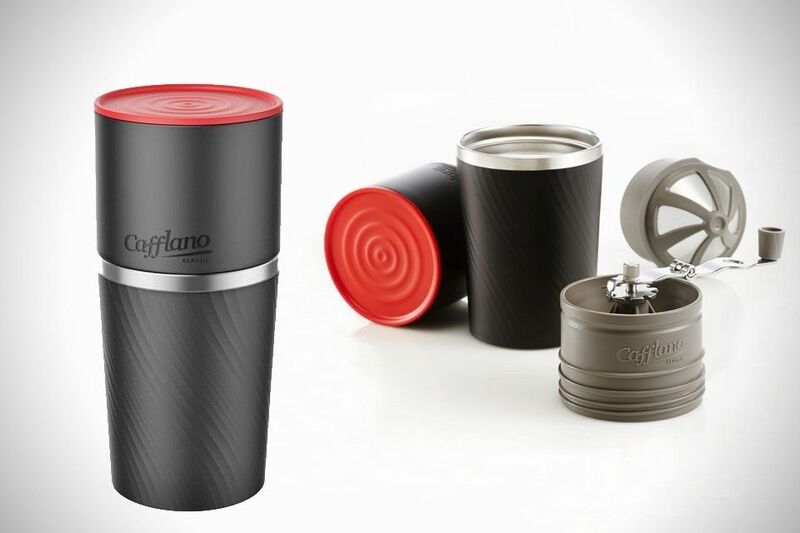 The Cafflano Portable Coffee Maker looks like your regular travel mug. The main difference is that it includes a water pourer, built-in filter, and a hand grinder into the deal. Within a few minutes, you’ll produce your favourite blend. It’s one of the least complicated camping gadgets to use. Place your beans into the ceramic grinder, set your preferred coarseness level, grind then pour in your hot water. In a few minutes, you’re enjoying a mean mug of joe. There really is nothing more to it than that. Light and compactable for easy transportation. Uses insulated walls to ensure that coffee stays heated longer than the average mug. Whoever decided it was a good idea to combine a portable stove with a mobile phone charger is a genius. 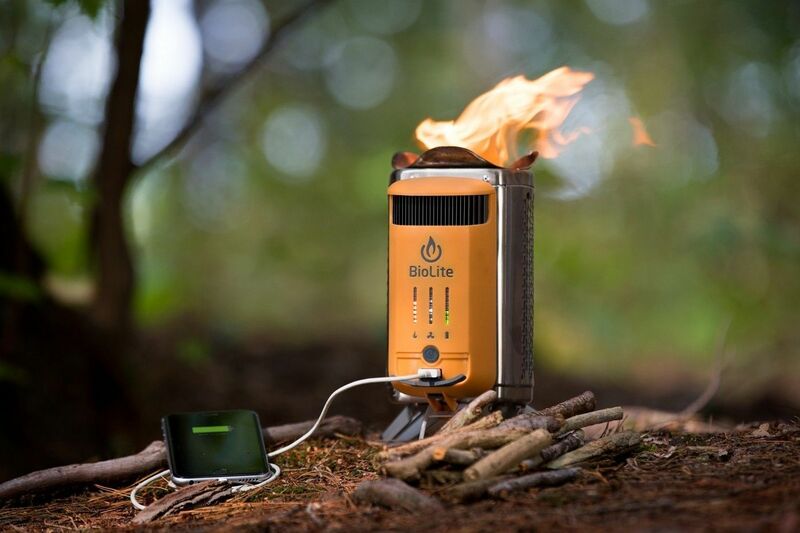 The BioLite CampStove 2 is an upgrade on the original CampStove model. This time round, the CampStove offers more power, an additional integrated battery and an updated LED dashboard. Now users can easily keep track of control and feedback. This is yet another multitasking camping gadget that is extremely useful and shows how technology can enhance camping drastically. Not only does this cool camping gadget cook and heat the camp, it also acts as a power unit for many of the most commonly used portable devices.